When I attended the Leadership Summit in 2009, I had the opportunity to hear from a number of great speakers, like Wess Stafford of Compassion International and Former U.K. Prime Minister Tony Blair. I had a fantastic time attending the summit and enjoyed great fellowship with other attendees. A few weeks after the conference, a friend asked me how I had enjoyed the conference and what I had gotten out of it. I told her that I really enjoyed the conference, but didn’t have a great answer about what, if anything, I got out of it. There wasn’t anything wrong with the Summit, but there was something wrong with me. I paid attention during the messages, but I made the grievous mistake of not taking notes. It turns out we’re much better listeners when we take notes. We also come out of the Summit with something to reference after the fact. My goal for the Summit this year is to listen well, take good notes, and have actionable things that I can do to improve myself as a leader as a result of the Summit. This year, I was able to pick out a few helpful concepts that I will be able to make use of in my life as a Christian leader during the next year and throughout the course of my life. During the first message on Thursday, Bill Hybels shared that every idea has a life cycle. The ministry strategies, worship music and stewardship tools that were effective in the 1970’s are not what will bring the church successful ministry in 2011 and beyond. Likewise, what works today will likely be less effective in the future. A couple of other Christian leaders and I saw this play out in a ministry that I’m involved at Central Baptist. We have had a post-college/career ministry, which was meeting well before I came to the scene in 2007. I became involved in leadership in the group of 2008. 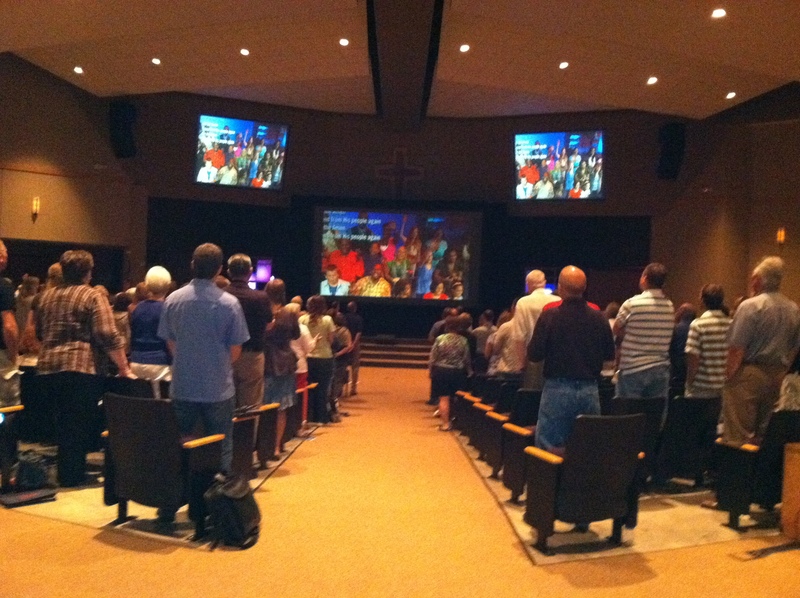 We met every Tuesday night at the church, and had as many as 40 people attending each week during its peak. Over the course of the next two years, numbers slowly and steadily decline from 40 to 12 each week. The same ideas that we were using years ago were no longer effective. It turns out as that the people involved in the ministry grew older, their ministry needs changed. Some people moved, others got married and a few had children. Some people moved on to the cool new ministry down the street because our ministry wasn’t the “in” thing anymore. We finally reached our “I’ve had it moment” last year and moved to a new model. We realize that it’s just not going to work for busy families to try to get together every Tuesday night to do a bible study. Rather, we refocused our mission on having authentic community. We now have a successful supper for six rotation and have monthly times of fellowship and community. Just as the ministry model we used in 2007 no longer works in 2011, the ministry model that our group is using in 2011 will likely no longer 2015. We had a tough transition to the model that we’re using now, but I believe in the future we’ll do a better job of monitoring what’s working, what’s not and making appropriate changes as a result. If it is to be, it’s up to me. Newark Mayor Cory Booker also spoke on Thursday morning. Booker has been mayor of Newark since 2006. He is not without controversy, but he his administration has successfully reduced crime in the city, improved the educational opportunity in the town. He’s also the founder of New York Now and is the reason why Mark Zuckerberg gave $100 million to help revitalize the city’s school system. Booker is a living testimony of his message.—if it is to be, it’s up to me. Booker shared that we are the result of the people in the world that came before us who did not see the world in the way that others saw us. In the days of slavery, some saw freedom. During the days of sweatshops and child labor, some saw legal protections and a public education system. During the age of voting inequality, some saw full suffrage for all people. We now live in an age of economic hardship, war and polytheism. How do we see the world? We were told that we should not see the world for what it is, but what it has the possibility of being. Our attitude toward the world is a reflection of our attitude toward the world. We need not follow the mold set out for us, simply tolerating the hardship and sin in the world. Rather, we should stand up and use our blessings to make the world a better place. During the second half of the 20th century, many churches latched on to what was known as the “church growth movement.” The idea was successful churches must be growing numerically year after year. Churches with this mindset believe that they are following the Great Commandment and the Great Commission because of their growth. We are called to go and make disciples of all nations, but does having a lot of people walk through the doors on the church on a Sunday morning necessarily mean we’re following Christ’s commands? Most of us would love to fulfill the commands that Christ gave to the church by building ministries that are going up and to the right on a consistent, regular basis. We would love to be part of successful organizations that a lot of people are connected to and have a large budget. That’s an easy calling, but not all of us are called to do that. Some of us have very difficult callings—callings that will involve us witnessing pain, suffering and death. During the morning of the second day of the Leadership Summit, three stories of leaders that had received hard callings were highlighted. The one that stole the show was Mama Maggie Gobran, who started a ministry called Stephen’s Children in Cairo to serve the poorest of the poor children. She had grown up wealthy and taught computer science at the university level. She said that God had promoted her in the Kingdom and called her to go and serve the poor. Mama Maggie has a tough calling, one of the toughest. She is a quiet servant working in an impoverished part of the world. Yet, she was given a prominent role speaking at the Leadership Summit. The crowd hung on her every word and gave her a standing ovation. This is a sliver of what God’s Kingdom will look like. In eternity, we will look up to those that have tough callings as heroes of the faith and listen attentively to their wisdom. Some of us will have callings that are more difficult than others. So far, I’ve been given a pretty easy calling. I’ve been called to give the local church my best gifts and am working to do so by doing information technology work, coordinating financial peace university classes and serving as a trustee for the church. This could change in the future as God reveals his will for the life of myself and my wife, but we will look up to the Mama Maggie’s and Mother Theresa’s of the world in eternity. Here’s to those with tough callings. Something I've had to accept in business is that things for work for a period of time, then sometimes they stop working, and it's okay to change. Just because you change the way you do something, doesn't mean that thing was pointless or without value or that you were wrong in some way. The thing was just effective at a certain time under certain conditions, but it's not now, so you change. At Blend, we used to have a 9 a.m. production meeting every morning where everyone would report in on their projects and plans for the day. We did it for years, and it worked great, until one day we realized that it was getting long, and people were listening for 15 minutes and talking for two, and it became a waste of time in a lot of ways. So we stopped doing it. Now, there's a tendency to think, "Well, it obviously wasn't a good idea in the first place," but this isn't true. It was a good idea, and it worked great when we were less than 10 people and had less then 20 projects bubbling on any given day. But then we grew, and we essentially outgrew this meeting. Ideas indeed have a lifecycle, and — at certain points — some ideas just come to a natural end. Jim Collins in the "Good to Great" series talks about "preserving the core, and keeping what works." You try a lot of things in business. Some things work, some don't, and some work for a while, then become less effective. This is natural. One of the greatest sins in business is to keep doing something just because it worked at one time and you're too afraid or embarrassed to admit that it doesn't work anymore.